Flip Flop Fly Ball: An Infographic Baseball Adventure is the most enjoyable baseball book I have read since The Soul of Baseball. And that is saying a lot. First off, allow me to give you some background on how this book came to be. Author Craig Robinson is an Englishman who didn’t take interest in the sport of baseball until later on in life. He first saw a baseball game when he travelled to New York on business (an Englishman in New York, if you will) and fell in love with the game like so many of us have. As is the case for many of us, his love affair with baseball became an obsession. From this obsession Craig began to ask himself a lot of questions, questions that you and I may not think about. This is because of the fact that Robinson came to baseball so late in life and sees it through a fresh pair of eyes; he has an entirely different perspective. Instead of just asking Google the questions and finding the answer and moving on, Craig utilized his graphic design talents into creating infographs to tell the entire story. As the charts and graphs began to stockpile, Robinson needed something to do with them. He created a weblog called “Flip Flop Fly Ball” and began posting them. It wasn’t long before word spread within the baseball community as to what Robinson was doing. A few baseball websites/blogs would “repost” some of Robinson’s infographics. I remember the first one of his I saw was called “Really Fantasy Baseball.” It was a box score of a game that took place between the E-Street Band and the Wu-Tang Clan. A home game for the E-Streeters, the game took place (of course) at their home field Asbury Park. The best part? The “Big Man” Clarence Clemons took the RZA deep. I was hooked. Flip Flop Fly Ball was added to my favourites. I then learned through ESPN’s Page 2 that Flip Flop Fly Ball had signed a book deal with Bloomsbury. Finally! A blogger had made it! I waited with baited breath to see the fruits of Craig’s labour. I knew he would do us all proud – and he did. Craig was good enough not to focus all of his efforts solely on the book during his time writing it. 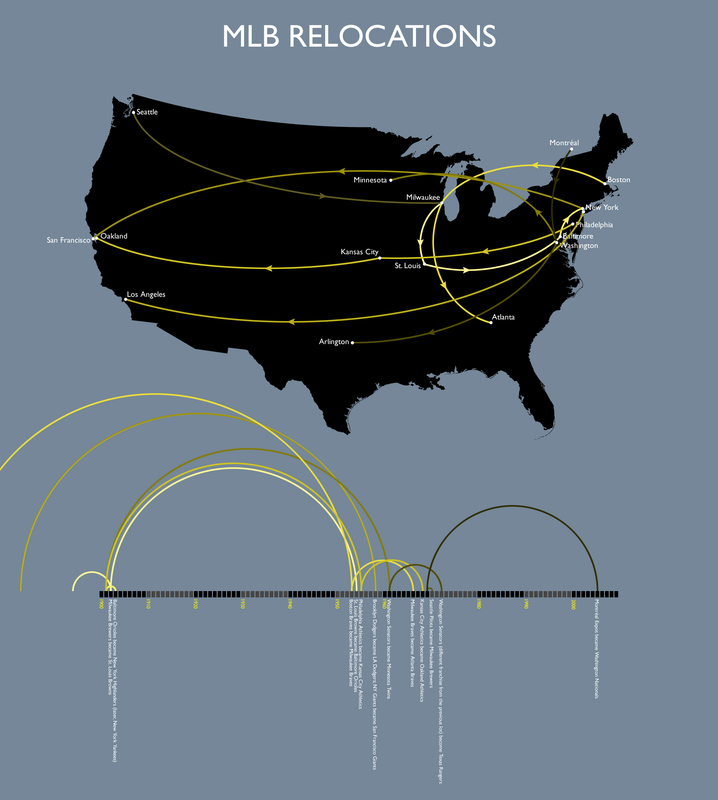 He would continue to post infographics, including this one (my absolute favourite): MLB Relocations. Like Craig, I too benefit a great deal from charts to remember team relocations. I always struggle with remembering that the Baltimore Orioles became the New York Highlanders and then the St. Louis Browns…. became the Baltimore Orioles. I won’t even get started on the mess that is the Washington Senators. Anywho, as I came to creep on Craig’s site more frequently, I noticed that he had a Flip Flop Flying empire of websites. One of them is his personal blog, so I thought I would take a quick read. To my surprise, Craig was living the dream, so to speak. That is, he was living *my* dream. It probably wouldn’t seem like it to him, but I was enamoured with what appeared to be his jet-set lifestyle. From what I could gather, Robinson was a freelance graphic designer/artist who had lived in England, Berlin, Toronto and now Mexico City. While my graphic design skills are limited to crude MS-Paint drawings, I saw a lot of parallels between Craig and myself. He is his own boss and he gets paid to write and do work relating to baseball, his love. That’s what I want to do! He lives in Mexico and watches Mexican baseball on a regular basis. I used to live in Mexico (though on the west coast) and I’ve witnessed a Mexican Baseball Game too! Robinson travels on the reg, has good times on the reg and appears to be a citizen of the world. If he spent most of his time on a yacht with 20 bikini-clad women then he would have my ideal life. He also sports a snazzy old-school Expos cap. Basically, he’s the kind of guy you want your daughter to date. After this blog-mance between us, I couldn’t wait to get my hands on his book and read it from cover to cover once it was published. At first glance there were many “ah ha!” moments – the ones where I thought to myself, “I had always thought about that question but never found a way to articulate it.” Have you ever watched a Yankees game and looked out at Monument Park and wondered aloud: “There are so many player numbers retired – when are they going to run out? !” Flip Flop Fly Ball has it covered with an infographic projection of when the Yankees will in fact run out of player numbers. Want to know what stadium parking lots look like from an aerial view? Robinson has you covered. The highest and lowest ticket prices? Attendance? Positioning of home-team dugouts? Ballpark orientation? Ballpark elevations? (You really appreciate how Denver absolutely BLOWS THE OTHER BALLPARKS AWAY when it is presented to you in infographic format.) How many innings does it take for a broadcaster to mention a pitcher is throwing a no-hitter? How often does the best team win the World Series? How often does the highest payroll win the World Series? What percentage of players wear high socks? These are things I think about constantly but never talk about and I’m sure you can relate. Flip Flop Fly Ball has it on lock. The charts aren’t limited to MLB either. The KBO, NPB, TML, WBC, PCL, MiLB, Independent Leagues, and the All-American Girls Professional League all get the infograph treatment. Not only that, but Craig sprinkles some witty commentary into some of the charts to keep you on your toes. Case in point: the Molina Brothers and the interests that they have in common. He also makes keen observations, noting how ironic it is that a team with a name as offensive as Cleveland’s plays in a ballpark known as Progressive Field. Yet there’s more to the book than just infographs. Interspersed between them are essays (and paintings – he is, after all, an artist) detailing Craig’s experiences with baseball first-hand. He goes on baseball road trips much like we do here at Mop-Up Duty. From these essays I learned that Coors Field has the best view in all of baseball. I take Craig at his word too – he did the same West Coast Ballpark Tour that I did last summer (and not surprisingly, felt the same way about Dodger Stadium that I did). I can only hope to add Coors Field to my list of ballpark reviews one day. That cap logo, the “Jays” on the chest – market researched into an ugly lack of personality that is painful to see on fans. 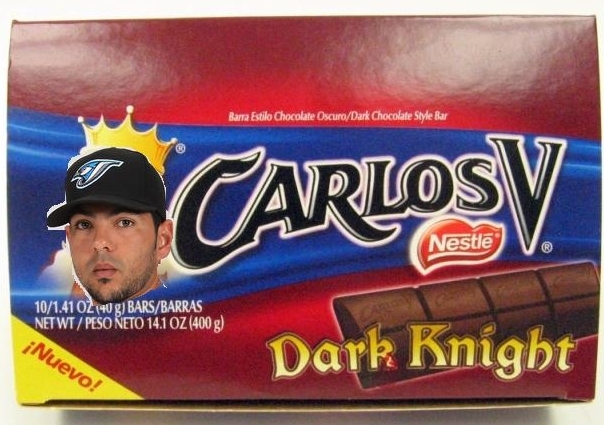 Even the steroid-y pumped-up blue-jay-with-biceps logo of the early 2000s is better than this one. There’s the black alternate jerseys too. And the lazily designed “T” on the road caps . . . It’s even sadder because of the beauty of their earlier logo: The beautiful, graphically strong blue jay’s head over a baseball with a maple leaf to offset the side. Although it’s not included in the book, Jays fans who obsess over the glory days will be interested in this specific infographic. Baseball might be the most complicated sport in the world. As you read the book you find how remarkable it is that Robinson has picked up on all of the nuances of baseball in such a short period of time. Some of these particulars haven’t picked up by many fans during a lifetime following the sport; many of these we take for granted. To paraphrase what Rob Neyer says in the book’s foreword, Craig sees things in baseball that most of us just don’t see. It’s not so odd to me that he sees things I don’t see, what’s odd to me is that Craig sees things that nobody else sees. It’s not often we have the opportunity to see things that have been with us our entire lives in a new light and Flip Flop Fly Ball offers that opportunity. Do yourself a favour and buy this book. It provides insight into the game of baseball you won’t find anywhere else. You’ll also have the coolest book on your coffee table for when you throw one of those dinner parties you keep having.